Especially, drug delivery via nanoparticles is already a proven method for delivering active agents which have been administered before oral or by injection. (Bawa 2008) Nano-formulated drugs can be dosed and delivered much more efficient as new techniques open completely novel ways of medical treatments. This high-potential technology helps delivering drugs, heat, or other active substances to specific cells, i.e. diseased cells. By this direct drug delivery, healthy cells are untroubled by drug effects. One field, in that nano-formulated drugs already show their promising results is the cancer therapy. In the cancer therapy it is the big advantage of nano-sized substances that high doses of drug molecules can be delivered directly to the tumor cells for maximum effects while minimizing side effects to other organs. (Liu et al.2008) This advantage results in the nano-size by that the particles are able to pass cell walls and membranes and release the drug’s active agents directly at the targeted cells. As nanomaterials are defined as particles with a dimension less than 100nm this means that the production and processing of these substances require higher efforts. Functionalized Carbon Nanotubes (f-CNTs) can also act as vaccine delivery systems. The basic concept is to link the antigen to carbon nanotubes while retaining its conformation, thereby, inducing antibody response with the right specificity. Ceramic nanoparticles, i.e. derived from silica, titania or alumina, feature a porous particle surface that makes them an ideal drug carrier. Pic. 1: Hielscher’s lab device UP50H for the sonication of small volumes, e.g. dispersing MWNTs. To obtain nanoparticles with specific characteristics and functions, the surface of the particles has to been modified. Various nanosystems like polymeric nanoparticles, liposomes, dendrimers, carbon nanotubes, quantum dots etc. can be successfully functionalized for efficient use in pharmaceutics. In order to functionalize the complete surface of each individual particle, a good dispersion method is required. When dispersed, particles are typically surrounded by a boundary layer of molecules attracted to the particle surface. In order for new functional groups to get to the particle surface, this boundary layer needs to be broken up or removed. The liquid jets resulting from ultrasonic cavitation can reach speeds of up to 1000km/hr. This stress helps to overcome the attracting forces and carries the functional molecules to the particle surface. In sonochemistry, this effect is used to improve the performance of dispersed catalysts. Ultrasonic Functionalization of SWCNTs by PL-PEG: Zeineldin et al. 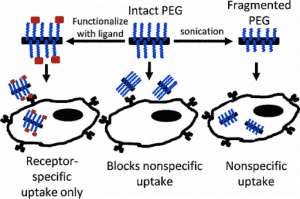 (2009) demonstrated that the dispersion of single walled carbon nanotubes (SWNTs) by ultrasonication with phospholipid-polyethylene glycol (PL-PEG) fragments it, thereby interfering with its ability to block nonspecific uptake by cells. However, unfragmented PL-PEG promotes specific cellular uptake of targeted SWNTs to two distinct classes of receptors expressed by cancer cells. Ultrasonic treatment in the presence of PL-PEG is a common method used to disperse or functionalize carbon nanotubes and the integrity of PEG is important to promoting specific cellular uptake of ligand-functionalized nanotubes. 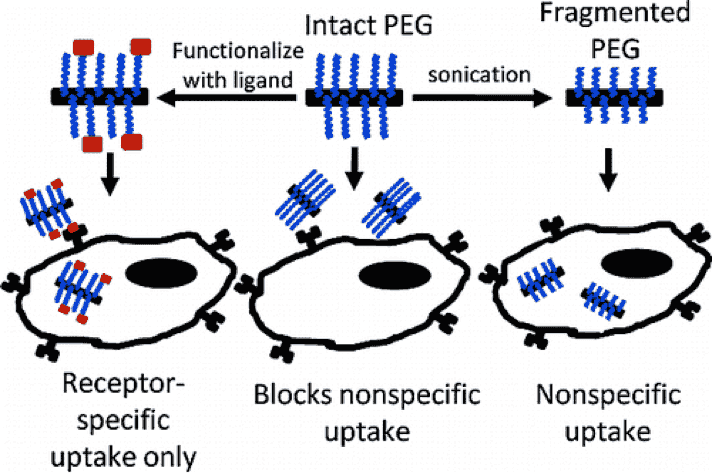 Since fragmentation is a likely consequence of ultrasonication, a technique commonly used to disperse SWNTs, this maybe a concern for certain applications such as drug delivery. Another successful application of ultrasound is the preparation of liposomes and nano-liposomes. Liposome-based drug and gene delivery systems play a significant role in manifold therapies, but also in cosmetics and nutrition. Liposomes are good carriers, as water soluble active agents can be placed into the liposomes’ aqueous center or, if the agent is fat soluble, in the lipid layer. Liposomes can be formed by the use of ultrasonics. The basic material for liposome preperation are amphilic molecules derived or based on biological membrane lipids. For the formation of small unilamellar vesicles (SUV), the lipid dispersion is sonicated gently – e.g. with the handheld ultrasonic device UP50H (50W, 30kHz), the VialTweeter or the ultrasonic reactor UTR200 – in an ice bath. The duration of such an ultrasonic treatment lasts approx. 5 – 15 minutes. Another method to produce small unilamellar vesicles is the sonication of the multi-lamellar vesicles liposomes. Dinu-Pirvu et al. (2010) reports the obtaining of transferosomes by sonicating MLVs at room temperature. Hielscher Ultrasonics offers various ultrasonic devices, sonotrodes and accessories to meet the requirement of all kinds of processes. Liposomes works as carriers for active agents. Ultrasound is an effective tool to prepare and form the liposomes for the entrapment of active agents. Before encapsulation, the liposomes tend to form clusters due to the surface charge-charge interaction of phospholipid polar heads (Míckova et al. 2008), furthermore they have to be opened. By way of example, Zhu et al. (2003) describe the encapsulation of biotin powder in liposomes by ultrasonication. As the biotin powder was added into the vesicle suspension solution, the solution has been sonicated for approx. 1 hour. After this treatment, biotin was entrapped in the liposomes. To enhance the nurturing effect of moisturizing or anti-aging cremes, lotions, gels and other cosmeceutical formulations, emulsifier are added to the liposomal dispersions to stabilize higher amounts of lipids. But investigations had shown that the capability of liposomes is generally limited. With the addition of emulsifiers, this effect will appear earlier and the additional emulsifiers cause a weakening on the barrier affinity of phosphatidylcholine. Nanoparticles – composed of phosphatidylcholine and lipids – are the answer to this problem. These nanoparticles are formed by an oil droplet which is covered by a monolayer of phosphatidylcholine. The use of nanoparticles allows formulations which are capable to absorb more lipids and remain stable, so that additional emulsifiers are not needed. Ultrasonication is a proven method for the production of nanoemulsions and nanodispersions. Highly intensive ultrasound supplies the power needed to disperse a liquid phase (dispersed phase) in small droplets in a second phase (continuous phase). In the dispersing zone, imploding cavitation bubbles cause intensive shock waves in the surrounding liquid and result in the formation of liquid jets of high liquid velocity. In order to stabilize the newly formed droplets of the disperse phase against coalescence, emulsifiers (surface active substances, surfactants) and stabilizers are added to the emulsion. As coalescence of the droplets after disruption influences the final droplet size distribution, efficiently stabilizing emulsifiers are used to maintain the final droplet size distribution at a level that is equal to the distribution immediately after the droplet disruption in the ultrasonic dispersing zone. Liposomal dispersions, which are based on unsaturated phosphatidylchlorine, lack in stability against oxidation. The stabilization of the dispersion can be achieved by antioxidants, such as by a complex of vitamins C and E.
Ortan et al. (2002) achieved in their study concerning the ultrasonic preparation of Anethum graveolens essential oil in liposomes good results. After sonication, the dimension of liposomes were between 70-150 nm, and for MLV between 230-475 nm; these values were approximately constant also after 2 month, but inceased after 12 month, especially in SUV dispersion (see histograms below). The stability measurement, concerning essential oil loss and size distribution, also showed that liposomal dispersions maintained the content of volatile oil. This suggests that the entrapment of the essential oil in liposomes increased the oil stability. Fig. 3: Ortan et al. (2009): Stability of MLV and SUV dispersions after 1 year. Liposomal formulations were stored at 4±1 ºC. Next to the ultrasonic production of nanoparticles, the processing of these substances is a wide field for applications of ultrasonication. The agglomerates have to be broken, particles have to be detangled and/or dispersed, the surfaces have to be activated or functionalized, and nano-droplets must be emulsified. For all these processing steps, ultrasound is a proven essential method. High-power ultrasound generates intense effects. When sonicating liquids at high intensities, the sound waves that propagate into the liquid media result in alternating high-pressure (compression) and low-pressure (rarefaction) cycles, with rates depending on the frequency. During the low pressure cycle, high-intensity ultrasonic waves create small vacuum bubbles or voids in the liquid. When the bubbles attain a volume at which they can no longer absorb energy, they collapse violently during a high pressure cycle. This phenomenon is termed cavitation. Hielscher is the top supplier of high quality and high performance ultrasonic processors for lab and industrial application. Devices in the range from 50 watts up to 16,000 watts allow to find the right ultrasonic processor for every volume and every process. By their high performance, reliability, robustness and easy operation, the ultrasonic treatment is an essential technique for the preparation and processing of nanomaterials. 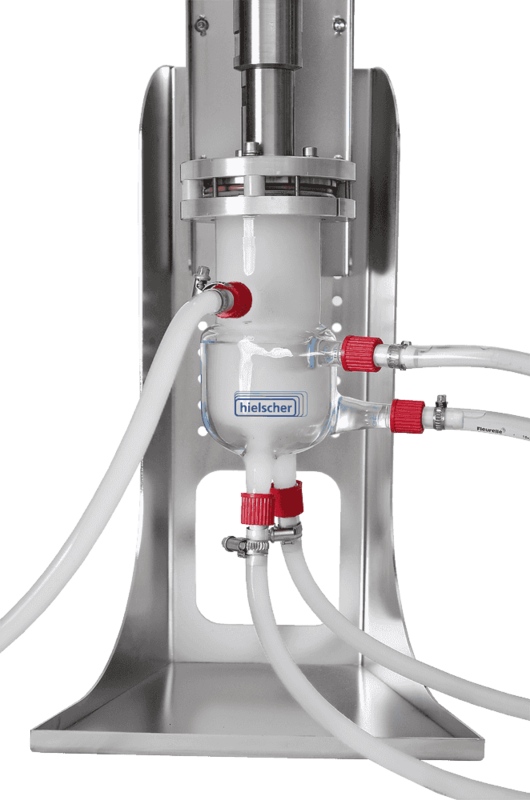 Equipped with CIP (clean-in-place) and SIP (sterilize-in-place), Hielscher’s ultrasonic devices guarantee safe and efficient production according to pharmaceutical standards. 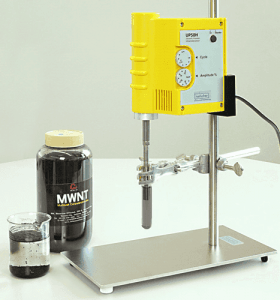 All specific ultrasonic processes can be easily tested in lab or bench-top scale. The results of these trials are completely reproducible, so that the following scale-up is linearly and can be easily made without additional efforts regarding the process optimization. Pic. 2: Ultrasonic flow cell reactor allow for continuous processing. Bawa, Raj (2008): Nanoparticle-based Therapeutics in Humans: A Survey. In: Nanotechnology Law & Business, Summer 2008. Jeong, Soo-Hwan; Ko, Ju-Hye; Park, Jing-Bong; Park, Wanjun (2004): A Sonochemical Route to Single-Walled Carbon Nanotubes under Ambient Conditions. In: Journal of American Chemical Society 126/2004; pp. 15982-15983. Ko, Weon Bae; Park, Byoung Eun; Lee, Young Min; Hwang, Sung Ho (2009): Synthesis of fullerene[C60]-gold nanoparticles using non-ionic surfactantspolysorbate 80 and brij 97. In: Journal of Ceramic Processing Research Vol. 10, 1/2009; pp. 6-10. Liu, Zhuang; Chen, Kai; Davis, Corrine; Sherlock, Sarah; Cao, Qizhen; Chen Xiaoyuan; Dai, Hongjie (2008): Drug Delivery with Carbon Nanotubes for In vivo Cancer Treatment. In: Cancer Research 68; 2008. Mícková, A.; Tománková, K.; Kolárová, H.; Bajgar, R.; Kolár, P.; Sunka, P.; Plencner, M.; Jakubová, R.; Benes, J.; Kolácná, L.; Plánka, A.; Amler, E. (2008): Ultrasonic Shock-Wave as a Control Mechanism for Liposome Drug Delivery System for Possible Use in Scaffold Implanted to Animals with Iatrogenic Articular Cartilage Defects. In: Acta Veterianaria Brunensis Vol. 77, 2008; pp. 285-280. Nahar, M.; Dutta, T.; Murugesan, S.; Asthana, A.; Mishra, D.; Rajkumar, V.; Tare, M.; Saraf, S.; Jain, N. K. (2006): Functional polymeric nanoparticles: an efficient and promising tool for active delivery of bioactives. In: Critical Reviews in Therapeutic Drug Carrier Systems, Vol. 23, 4/2006; pp. 259-318. Ortan, Alina; Campeanu, Gh. ; Dinu-Pirvu, Cristina; Popescu, Lidia (2009): Studies concerning the entrapment of Anethum graveolens essential oil in liposomes. In: Poumanian Biotechnological Letters Vol. 14, 3/2009; pp. 4411-4417. Srinivasan, C. (2008): Carbon nanotubes in cancer therapy. In: Current Science, Vol.93, No.3, 2008. Srinivasan, C. (2005) A ‘SOUND’ method for synthesis of single-walled carbon nanotubes under ambient conditions. In: Current Science, Vol.88, No.1, 2005. pp. 12-13. Suslick, Kenneth S. (1998): Kirk-Othmer Encyclopedia of Chemical Technology; 4th Ed. J. Wiley & Sons: New York, Vol. 26, 1998. pp. 517-541. Zeineldin, Reema; Al-Haik, Marwan; Hudson, Laurie G. (2009): Role of Polyethylene Glycol Integrity in Specific Receptor Targeting of Carbon Nanotubes to Cancer Cells. In: Nano Letters 9/2009; pp. 751-757. Zhu, Hai Feng; Li, Jun Bai (2003): Recognition of Biotin-functionalized Liposomes. In: Chinese Chemicals Letters Vol. 14, 8/2003; pp. 832-835.